The Intel Skylake platform was released over a month ago. Bringing minor gains in CPU performance but offering a whole host of extra features on the chipset, such as additional bandwidth and explicit support for NVMe, upgrading to the Z170 platform makes a lot of sense for users looking for a new system in mid-2015. 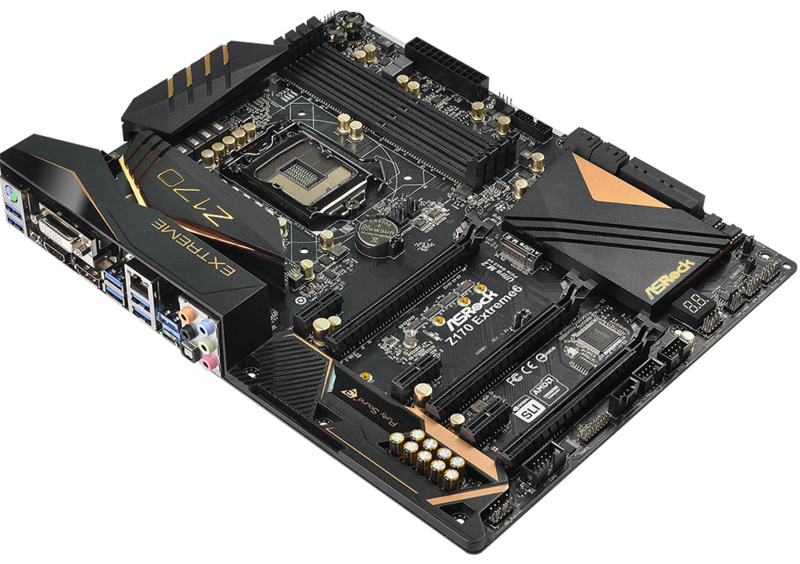 Championing the chipset is ASRock, who has no fewer than 17 Z170-based motherboards in its arsenal. Sitting near the top of the stack is the Z170 Extreme 6 that's priced at around £150. ASRock goes above and beyond the base chipset specification by adding a number of extra features that, it says, are primed for the enthusiast, so let's take a look. 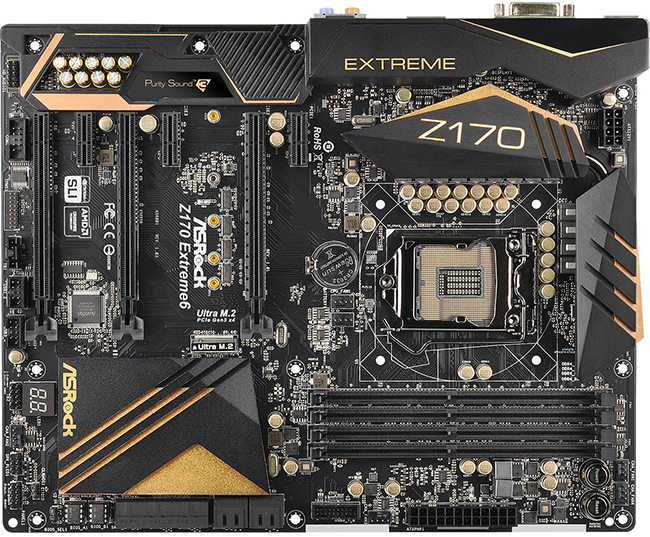 Presented in a standard ATX form factor, the Z170 Extreme 6 looks good in its black-and-gold livery. Two heatpipe-connected heasinks leave plenty of room around the socket for mounting large coolers, and remember that the mounting holes are the same as outgoing Z97. Built for the enthusiast, a 12-phase power supply offers up to 60A on the chokes and is consistent with other premium boards. Complementing the chokes are Nichicon capacitors lasting at least 12,000 hours. Manufacturers look to enhance a board's reliability by using better components on enthusiast boards; the same approach is evident here. Continuing that theme, the board supports Nichicon-powered audio offering up to 115dB Signal-to-Noise ratio, a debug LED, six (4-pin) fan headers, well-spaced expansion slots, and a full-speed M.2 riding off the chipset. Drilling down, you may know that Intel offers very granular control over the CPU's base clock - now available in 1MHz increments - but ASRock goes further by including a dedicated clock generator that, believe it or not, enables the user to fine-tune the base clock in 0.0625MHz increments. The reason for doing so is to allow enthusiasts the maximum possible configurability when overclocking a system. The top two PCIe x16 slots take their bandwidth from the CPU, so either x16 or x8/x8, and the board is certified for both SLI and CrossFire configurations. The bottommost slot, meanwhile, grabs up to four lanes from the Z170 chipset. The trio of PCIe x1 slots are interesting insofar as they're open-ended on the right-hand side, meaning that longer cards can be added albeit limited to x1 speeds. Storage-wise, alongside the single M.2 and half-a-dozen SATA3, a SATA Express connector rides off the chipset, while ASRock adds a further two SATA3 by way of an ASMedia controller. Though the Z170 is more feature-rich and faster in terms of connecting I/O to the processor, the M.2, two SATA3 and SATA Express all share lanes; if one of them is used it renders the others inoperable. The folks over at ASMedia are busy again providing the support for USB3.1, here represented by both a Type-A and Type-C port. There's a further six USB 3.0 from the chipset, plus a board-mounted header for two more, while the display outputs make good sense on a modern motherboard. The clear CMOS connector is handily placed at the back, as well. A balancing act has to ensue when deciding between features and price. ASRock, we feel, has it just about right with the Extreme 6.